That old Gelert wizard is your mentor in Spell Casting 101, and because you're the apprentice in this story, you're the one who has to practice incantations by putting runes together to create spells and advance. But beware - the path of sorcery is not an easy one, and your fancy wand-waving can get you and your mentor in trouble if you're not careful! The goal of the game is to create strings of at least three runes to move on to the next level - and of course, the longer the string, the more points you'll get. To do that, simply click on a tile, and then click on another adjacent tile, and then another... you get the idea. They have to be adjacent, remember that. A typical tile. Yawn. Put them together for points (100 each), although some of them may be worth more. Just look at the dot/s on the lower right corner to see how valuable an ordinary tile is. Nobody wants these in their spell books, obviously, but there they are, moving one space down with each string you submit. Make sure they don't reach the bottom, or else it's game over. One way to get rid of these is to... well, use them. There's another way to make these things disappear, but more on that later. Gold tiles will randomly drop on the board as you make tile combinations. They are worth more than regular or cursed tiles. Plus, using them will fill up that hourglass on the left side of your game screen. Believe me, you WILL need that hourglass in the future. Your selected tile turns purple. To erase the sequence of tiles you've created, click the one you started with again and choose another. Um, was this part of the table really necessary? As you can see, you've got a whole lot of tiles to choose from. You can even pick what kind of tiles to work with - symbols (akin to those you find on codestones), numbers, or words. 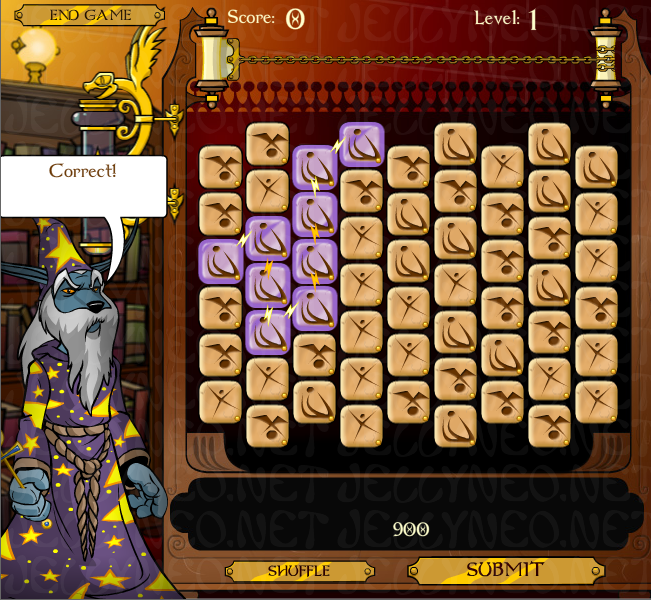 If you will be playing with symbols, you must create a sequence of identical runes. For numbers, you will be given a rule to adhere to (ex. all tiles must increase or decrease by 1). And of course, the last mode will require you to create dictionary words out of the letters given to you - which, in my opinion, can be quite tricky unless you're a whiz at that kind of stuff. The type of tiles has no bearing on the game in general, and as you keep on playing, you will eventually learn which mode you're best at. If you're unsure, the Gelert wizard is there to tell you if your sequence is correct or incorrect. To advance, you will need to destroy tiles to fill up your meter (or rather, your scroll) which is located on top of the tiles. See the table below for the exact number of tiles you need to destroy in each level. Now, what's that hourglass thing for? With every gold tile you play, it fills up, and once it's full and flashing green, you can click on it to clear all the cursed tiles, at which point it empties and you have to start racking up those shiny runes again. Another tip that goes without saying (but will be said here anyway) is that you must use this wisely. I'd emphasize that with italics, colors and flashing text, but... let's move on. If it seems like there aren't any (good) sequences to make with the tiles you've been dealt, hit the SHUFFLE button. The wizard will flick his wand and change those pesky tiles around, but it won't make the cursed ones disappear. In fact, it can actually move them to the bottom of the screen and put your game in jeopardy, or even make new ones appear. So be sure to use this function wisely too. To see how many points your sequence will give you, check out the number on the bottom - not to be confused with your total score, which is up there, in case the word SCORE isn't a dead giveaway. Especially when you're aiming for that elusive high score, don't just create a relatively short string of runes and submit it post-haste. Since you don't have a time limit, try to explore the different possibilities. Will a certain sequence give you more points, clear some cursed tiles, and/or score some gold ones? Think before you cast; this becomes more and more important as the levels get progressively harder. Don't force yourself to play a mode that you aren't particularly fond of. Like I said, it doesn't affect the gameplay and won't ruin your chances of getting into the high score table. But what exactly IS the best mode for you? You'll find out as you keep on playing. Personally, I'd suggest beginning with number mode, since it's less limiting than the other modes - you could even get 100K in the first level. Start by shuffling until you have at least three gold tiles you can use to create a long sequence (thanks to kabouterland1 for this tip!). Go for the gold and get your hourglass ready for those times when you need a clean sweep to rid you of those slimy tiles. Speaking of gold, you can use those glistening tiles to save you when your hourglass is bare and you've entered the danger zone. If you only need a little more to advance, see if you can take the risk and make a long enough sequence. Of course, you have to be careful - if your spell doesn't bring you to the next level, it'll bring you to Game-Overville. Anticipate your moves. Before shouting your incantation to the heavens, see what will happen once those tiles are gone. Do you stand a better chance of clearing a cursed tile if you let it drop one more space down? Can you include that gold tile in your next move? It's like chess, and you can take all the time in the world to think. Do you see a time limit? I don't. If you do... um, you might want to get your eyes checked. To snag some extra points in the earlier levels while it's easier to make the grade, try making a series of shorter chains to almost fill your scroll meter to full, then make one final enormous chain to progress onward while earning you a nice points bonus. And most of all, have fun learning how to be a wizard!